Will this be the Pirates’ year? 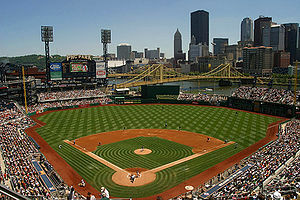 Can the Pirates end their infamous losing streak this year? In two words- probably not. In the early part of the season, there has been a glaring weakness for the team- they CAN’T HIT the ball! They rank near the bottom of almost every hitting statistic in the league. They are last in batting average, home runs, and on base percentage. And they are not even last by a point or two. It’s a pretty big gap in almost every stat between them and the next worst team. Their power hitter of the future, Pedro Alvarez, is batting around .050 and is on pace to break the alltime record for strikeouts by a better in one season! On the bright side, the pitching looks pretty good, Andrew McCutchen is signed to a long term deal, and PNC Park is still a great place to watch a game. But to me, that is not nearly enough to end the Pirates‘ 19 year losing streak. It looks like they will make it two straight decades of losing. Posted on May 2, 2011 by Corey W.
If you’re a teenager, you’ve never seen The Pittsburgh Pirates finish better than .500. Sad, but true. I barely remember the ‘Bucs being competitive when I was a kid. Since Jose Lind’s error in game seven of the 1992 NLCS it’s seriously all been downhill. Not one winning season! But there were many years when they were great. The Pirates have been around since 1882 (they’ve been known as the “Pirates” since 1891), winning 9 NL Pennants, and 5 World Series titles. Some of the greatest players of all time have suited up for the ‘Bucs: Honus Wagner, Ralph Kiner, Bill Mazeroski, Willie Stargell, Barry Bonds, and OF COURSE Roberto Clemente–humanitarian, member of the 3,000 Hit Club, and strong-armed right fielder. Now is a great time to learn more about Clemente–a wonderful graphic novel 21: The Story of Roberto Clemente has just come out and the author/artist is going to be signing copies at Phantom of the Attic Comics in Oakland on May 21st. Chasing 3000 (motion picture, 2008) – Two brothers, one of whom is afflicted with muscular dystrophy, make the drive from Los Angeles to Pittsburgh in hopes of witnessing Roberto Clemente’s 3000th hit.